So, when is enough enough, and when is it overkill? That is a question I ask myself constantly – mostly at work, but pretty much in all situations. I learned years ago that there is a big difference between good enough, and too much. The difference can actually mean good enough somewhere else – if you understand where I am going with this. The time we invest in going overboard could be time actually well spent somewhere else. In a world (at least like mine), where there is never enough time – it is an important question to ask, and I think the most successful people are the ones that know exactly how much time to spend to get the biggest return. I admit that sometimes it is luck, but I have to believe this is something you can get good at over time. Take food for example, the time it takes to make homemade caramel vs. buying a jar in the store, in my opinion, is well worth it. I have had some good purchased caramel, but it is nothing like what I can make using sugar, butter and cream. Homemade pretzels though that you are going to crush up and cover with caramel after placing on the blondies – in my opinion, not worth the time. I’m sure you can make some pretty amazing pretzels, but that my friend, seems like overkill. 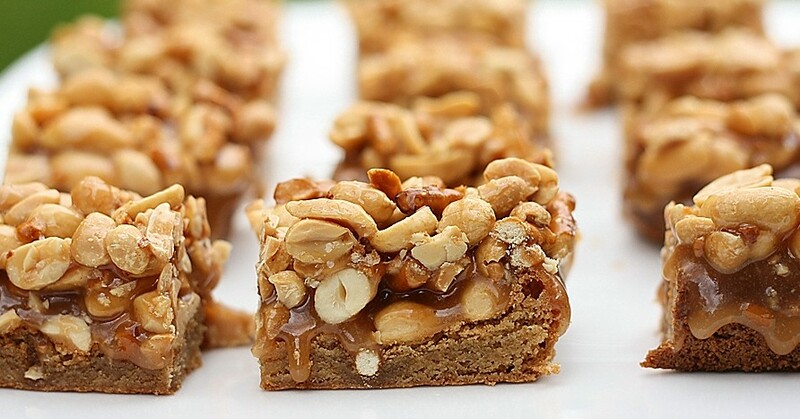 This recipe from Bon Appetit, well worth every minute I put into them – the chewy blondies, the salty pretzels combined with the sweet homemade caramel – it was over the top, but wonderful at the same time. I guess sometimes overkill is the way to go…as long as you leave some time for the next amazing quest. For blondie: Preheat oven to 350°F. Line baking pan with parchment paper, leaving a 1″ overhang on long sides of pan. Whisk flour, baking powder, and salt in a medium bowl; set aside. Stir butter in a medium skillet over medium heat until browned bits form at bottom of pan, 7–8 minutes. Transfer to a medium bowl. Add brown sugar. Using an electric mixer, beat until well combined and mixture resembles wet sand, 2–3 minutes. Add eggs and vanilla; beat until fluffy and well combined, about 2 minutes. Add dry ingredients; beat until smooth (batter will be thick). Using an offset or regular spatula, evenly spread batter in prepared pan. For peanut-pretzel caramel: Preheat oven to 350°F. Line a rimmed baking sheet with parchment paper. Spread peanuts over sheet in an even layer. Bake, stirring frequently, until golden brown and fragrant, 5–7 minutes. Set aside. Run a knife around short sides of pan to release blondie. Using parchment-paper overhang, lift from pan. Cut lengthwise into 4 strips. Cut each strip crosswise into 10 bars. DO AHEAD: Chill for up to 1 week in an airtight container. Bring to room temperature before serving. So glad you posted these! They are AMAZING and had the perfect amount of crunch and chewiness, salty and sweet. Thanks Liz – and hopefully I will see you tonight at Arts Night! If only I could have written about what was really going through my mind…at least it made for a funny post! i made these a few months ago and LOVED them! I remember seeing them on your blog – they looked amazing, so I had to try them!! !